COLUMBIA, S.C. (AP) — South Carolina’s last trip to Clemson was memorable for all the wrong reasons. Two years later, the Gamecocks believe the gap with their highly ranked rival is closing. In 2016, overmatched South Carolina did about everything wrong and left Death Valley on the bad end of a 56-7 beatdown, one of the most lopsided losses in Palmetto State rivalry history . “It was embarrassing,” linebacker T.J. Brunson said Tuesday. South Carolina (6-4) gets a shot for redemption at No. 2 Clemson (11-0), hoping two years of building have gotten them closer to one of the country’s most dominant programs. The Gamecocks have lost four in a row to their rival . Another loss would mark the most defeats in a row to Clemson since the Gamecocks lost seven consecutive games from 1934 to 1940. But South Carolina’s offense, which sits sixth in the Southeastern Conference in offense (429 yards per game) and points (32.8), is clicking better the past month than it has all season. The Gamecocks have averaged almost 43 points in its past three games and feel primed to go against a Clemson defense that leads the Football Bowl Subdivision in fewest points allowed per game at 12.1. “I think it’s always important to start fast and try and get points on the board, no matter who you’re playing,” South Carolina tailback A.J. Turner said. That wasn’t the case at Clemson two years ago. The Tigers led 21-0 after the first quarter and never slowed down. They finished with their largest margin of victory in the rivalry since winning 51-0 in 1900. “We’re in a really good mindset right now and we’re really locked in,” Bentley said. Clemson was a veteran squad that had won the Atlantic Coast Conference title and played in the College Football Playoff the year before. The Tigers were led by some of the country’s best players in quarterback Deshaun Watson and receiver Mike Williams. South Carolina was in its first year with coach Will Muschamp with new faces, like freshman quarterback Bentley, still finding their footing. Muschamp angrily said afterward that he’d never again coach a team where some players “flat out quit.” And the coach believes his Gamecocks will be more competitive this time. 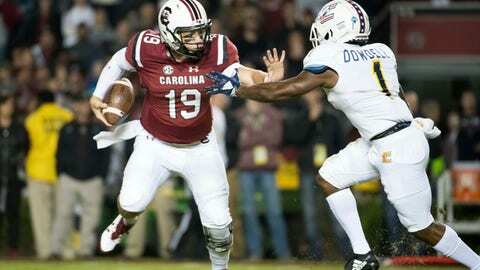 “We’re much better now than we were then,” Muschamp said. Bentley will face a defensive front likely to see all four starters drafted high by NFL teams next spring. Tiger defensive ends Clelin Ferrell and Austin Bryant and tackles Christian Wilkins and Dexter Lawrence have combined for 18 sacks and 38.5 tackles behind the line of scrimmage. Bentley understands he’ll have to block out those reputations, along with the noise for close to 82,000 at Memorial Stadium, and perform with poise and composure. “It’s an awesome atmosphere and it’s going to be fun to play,” Bentley said. Clemson has plenty at stake in this one. They’ll try and go 12-0 for just the third time in school history, following the 1981 national championship team and the 2015 Tigers that reached the CFP title game at 14-0 before falling to Alabama. South Carolina players understand their legacy could change dramatically with a stunning upset on Saturday. South Carolina would like to add a very big one to the tally this week.